After more than ten years of making music with turntables, tapes and loops the swiss based musician, artist, performer and architect Christoph Hess started in 1998 the project Strotter Inst. to concentrate just on the manipulation of turntables not using any records or sounds made by someone or something else. With five old manipulated Lenco turntables Strotter Inst. creats polymorph sound- and rhythmstructures. Inspite or probably because of the analogue sources the structures produce a contemporary and accurate athmosphere in space and time – somewhere between noise, bruitism, beat and meditative soundscapes. The work is based on the „Strategie des Zurückbleibens“: which means observe the ideas of avantgarde, find out what is contemporary, what is relevant, what is redundant and what is just ridiculous. Finally try to do the same by anachronistic techniques while people are blended by hipness and the possibilities of new tools. 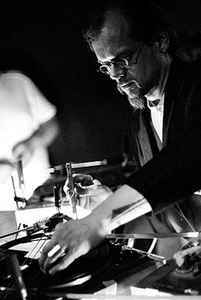 His live performances generate a dense sound and rhythmstructures by using five modified and manipulated lenco-turntables and various cut or scotched records. The music ranges from a low-fi rumble changing into concrete clicks and scrapes, followed by epic drones and multilayered broken beats to fall back into tricky bass-meditations. Alle werden angezeigt | Strotter Inst.